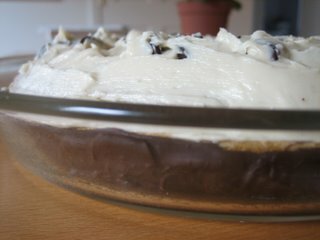 Nothing in the House: Sneak Preview: Emily's Birthday Cake Pie! Sneak Preview: Emily's Birthday Cake Pie! This photo is a SNEAK PREVIEW of the pie-shaped cake I will present to our very own birthday girl later tonight! It's a vanilla cake with a semi-sweet chocolate "crust" and vanilla chocolate chip icing piled high on top. Greg and I are freaking out because it looks so tasty. So happy birthday, Emily! We will dance the night away high on cake-pie in honor of you tonight! OH.MY.LAWD. Mandy=cake and icing queen. I am so exciting! I think this might be my most perfect birthday cake ever(although the purple cake and the cake-in-the-woods and the 'who-ate-the-birthday-cake' cake were pretty great too, though heavily dependent on context; this cake-pie can stand alone!) --pie-shaped white cake with white icing (vanilla on vanilla,just like I like it!) with a little kick of chocolate for good measure. AND DANCING! Mandy and home items and sea monsters sont fantastiques! tasted amazing too. The all-chocolate crust was utter insanity! I know, right? I'm totally psyched it turned out well. It's amazing what a chocolate dip can do for a vegan whole wheat apple sauce sinker cake. I love to bake! Yay! I wanna do it again! Something different this time! well, Meghan's birthday is on it's way....and Stacy's and Chris'. Lots of upcoming baking opportunities for this Taurus cohort! ummm, yeah. you guys are like so awesome at baking it is ridiculous. i think i would need a spaceship to reach your level of bakedom. at the bake-dome.